Around a month ago, the WWE surprised me with a pretty good Wrestlemania. On paper, it was a really boring and lame pay-per-view but, thanks to a bunch of high points and entertaining matches, I had to give this year’s Wrestlemania a thumbs up. I got this feeling of deja vu when they revealed the Extreme Rules pay-per-view card. None of the matches looked pretty interesting (which is strange for Extreme Rules). So, would the WWE pull another rabbit out of their hat again? Short answer: no. Not that there weren’t any interesting matches, though. Let’s break down each match, shall we? Another crazy vs. crazy fight for Dean. Well, this was technically the first match but both Dean Ambrose and Luke Harper left the arena to continue the match in an SUV. The announcers say that, since there’s no count out (and it is a Chicago Street Fight), the match hasn’t ended yet even though both participants have left the arena. Rating: Unable to give a rating! The match hasn’t ended yet! I never really liked the goody two-shoes Sheamus. I always thought he was more suited to being a monster, crushing everyone in front of him. So I love that The Celtic Warrior is back to his arse-kicking ways. While Sheamus dominated the majority of the match, Dolph Ziggler got the victory with a small package, surprising the Irishman. Now, the stipulation of the Kiss Me Arse match states the loser will have to plant his lips onto the winner’s buttocks. The fans were extremely hot, with the chant “Pucker Up” directed right at Sheamus. Sheamus, true to being a true heel, gave Ziggler a low blow and a Brogue Kick. While Ziggler was out, Sheamus grabbed his unconscious opponent and rubbed his face onto his white posterior. Overall, a pretty decent match. The surprise finish was brilliant and Sheamus still looked incredibly strong even though he lost. I am honestly glad to see the WWE putting a little bit more focus on the Tag Team Championship. Sure, I think the Tag Title Belt’s design is atrocious but I do love a good Tag Match! And this was a really good tag match! The match saw a lot of cool highlights, near falls and close calls which kept the fight moving at a brisk and satisfying pace. Cesaro and Big E got to show their power and Kidd and Kofi had their athleticism on full display. The finish came when Woods distracted the ref during a pinfall. Natalya then takes out Woods with a wicked slap. Chaos ensues and Kofi grabs the opportunity as well as a handful of tights to pin Cesaro for the win. The ending was kind of a mess but the match itself was pretty exciting. Also, what was so “extreme” about this? Still, I enjoyed it but it needed a better finish. 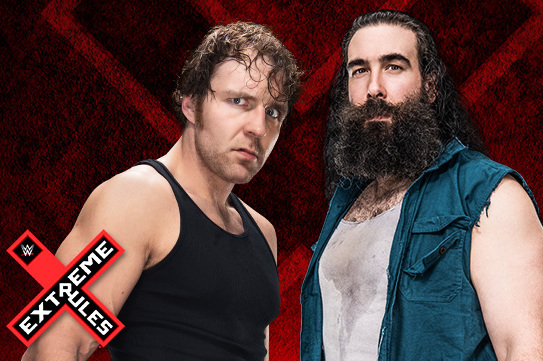 Match #1.5: Chicaco Street Fight: Dean Ambrose vs. Luke Harper PART 2! Can you spot Dean Ambrose in this picture? During The New Day’s post-victory interview, guess who comes driving back into the arena? Dean Ambrose inadvertently takes out the entire New Day with one massive elbow drop! The two opponents battle their way back to ringside and start tossing a myriad of chairs into the ring! The ending came with Ambrose tossing Harper from the top turnbuckle into a pile of steel chairs. One Dirty Deeds later, Ambrose gets his hand raised in victory. While what we saw was good, having not seen the entire fight (since they drove out of the arena) leaves me with a huge “what could have been” feeling in my heart. I had to dock half a point because of it. The obligatory “tug-of-war” portion of the match. Can I just say I don’t like Strap Matches? You can dress it up in a fancy name. Caribbean Strap Match. Bullrope Match. Russian Chain Match. Maybe it’s the stupid mechanics on how to win (touching all four turnbuckles in succession? Really?) or that they’re just not exciting to begin with. However you call it and whatever the reason, I find these bouts boring. And this was no different. There were no real high spots or really clever use of the chain/strap during this match. You got your choking, your dragging your opponent and what not. They’re all in here. If that’s your thing and you like Strap matches, then good. This was a pretty standard one though. Looks like both of them are glad AJ retired. Okay, I know Naomi turned heel when she attacked Paige. Fine. But when the heck did the Bella Twins become good guys? For me, that screwed up the match completely! Not only that, the match wasn’t even that great! The in-ring action was like an old Divas match on Raw… the ones where the Divas didn’t get that much respect. It also had a very sloppy finish with Brie slapping the taste out of Naomi’s mouth, enabling Nikki to deliver the Rack Attack on Naomi. I guess Naomi got to show her stuff, which made Nikki look really weak. Rating: 5 of 10… you know what? I’m too bored to think of anything clever so I’ll just leave it at that. If this was a Tables match, Big Show would’ve won two times right now! The WWE must be really working “creative” hard in order to make Roman Reigns the “next big thing.” They really hit a huge speed bump on the Road to Wrestlemania with their new Chosen One getting booed and jeered on the way to the Grandaddy of them all. But fans seemed to forgotten their hatred towards Reigns in Extreme Rules because his match with The Big Show was fantastic! This was actually the highlight/showstealer bout. As it happened during Extreme Rules, both Big Show and Roman Reigns ramped the extreme pretty high up! There was a lot of carnage and brutality. It looked like both competitors were really trying to knock each other out to make sure their opponent couldn’t answer the 10 count! 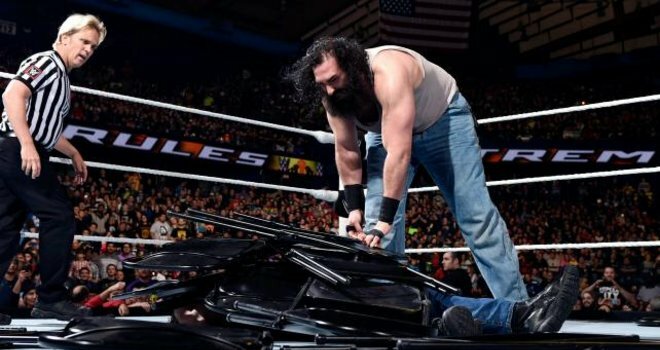 The finish had Reigns dumping the announce table on top of Show, pinning him down. 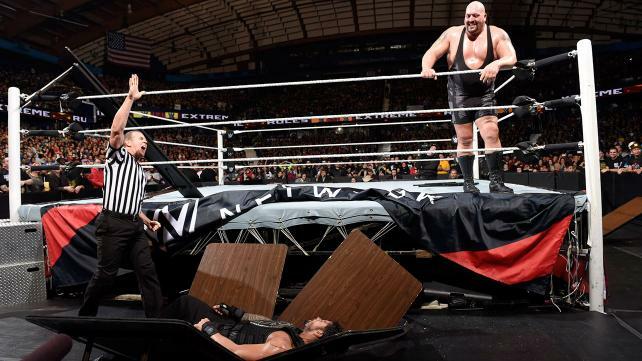 The ending would’ve been great but Reigns had trouble lifting the table which made the finish less believable. Otherwise, I loved this match! Guess who’s still the champ? I would say the above picture is a spoiler but, who are we kidding? There was no way Seth Rollins would lose to Randy Orton in Extreme Rules! It’s too soon for Seth Rollins to drop the belt to anyone! He’s definitely the WWE’s top heel as of right now and Seth Rollins is on a hot streak! As with any Steel Cage Match, both competitors teased us with near escapes and brutal hits using the cage as a weapon… with Seth Rollins taking the brunt of the punishment. While they didn’t do anything truly insane (no jumping off the top of the cage here), both Rollins and Orton looked particularly strong. I would’ve said this was a good match for what it was but it was mired by a really confusing ending. One of the stipulations of the match was that The RKO, Randy Orton’s finisher, was banned. Yet it was used several times! Once by Orton on Kane and once by Rollins on Orton. But it was allowed as the ref didn’t stop the match after either one of the RKO’s were executed! Really sloppy finish to an otherwise good match. Extreme Rules this year was okay for the most part. Unfortunately, even the good matches were mired by clumsy finishes. And, in all honestly, besides The New Day winning the Tag Team Championships, there was no reason to watch Extreme Rules. I have a strong feeling that the next pay-per-view will just be rematches of Extreme Rules. Overall, while some of the matches were fun to watch, they weren’t really that memorable. I don’t think that 10 years from now, people will look back fondly on the Russian Chain Match between Cena and Rusev. In fact, I’d rather wipe it from my memory right now. What did you think of this year’s WWE Extreme Rules pay-per-view? Let me know in the comments section below!